South Lake Tahoe is simply beautiful beautiful, and with so many outdoor activities, every season offers something special for visitors. Summer time is the busiest time because many schools have breaks and it is the only time of the year when some attractions are open. Winter is the second busiest season because of the cold winter weather that brings snow for skiing and for snowboarding. Spring is a probably the best time to visit South Lake Tahoe as the cold weather starts to warm up and some of the plants and flowers begin to pop up. Fall is also a good time because the foliage around the lake is stunning and children are back in school. January is one of the coldest months in South Lake Tahoe with the average low temperatures at a frigid 24°F (-4°C). This coincides with a whopping 73 inches (184 cm) of snow and the highest precipitation rate of 9 inches (220 mm). High temperature averages are at 40°F (4°C). In February, South Lake Tahoe experiences its coldest month of the year with the average low temperatures and the average high temperatures measuring in at 23°F (-5°C) and 39°F (4°C) respectively. Meanwhile, the snowfall increases to 75 inches (191 cm). South Lake Tahoe Weather in March: Winter sports are fantastic in March as snowfall is at its highest for the year at 85 inches (216 cm). Despite the incredible amount of snow, the average high temperature increases to 43°F (6°C) while the average low temperature sees a small increase to 25°F (-4°C). In April, the average high temperature climbs to 47°F (7°C). The average low temperature also increases by a few degrees to 28°F (-2°). Snowfall sees a drastic decrease with just 36 inches (91 cm) to be expected this month. May brings even lower levels of snowfall with just 9 inches (23 cm) expected. Precipitation levels are also quite low at 3 inches (68 mm). Meanwhile, the average low and average high temperature continues in its upward trend rising to 35°F (2°C) and 57°F (14°C) respectively. In June, the low temperature average and the high temperature average ranges between 43°F (6°C) and 57°F (14°C). Snow levels dwindle in this month at just 2 inches (5 cm). South Lake Tahoe Weather in July: It’s a dry month at South Lake Tahoe with the precipitation levels at their absolute lowest for the whole year in July. Just 11 mm of rainfall can be expected for this summer month as the average low and average high temperatures increase to 50°F (10°C) and 74°F (23°C) respectively. August is the hottest month of the year with the average high temperatures peaking at 75°F (24°C). The low temperature average holds steady at 50°F (10°C). In September the temperatures begin a downward trend with the average low temperature dropping quickly to 45°F (7°C). Similarly, the average high temperature sees a significant decrease to 67°F (19°C). It’s an eventful September in South Lake Tahoe as the snow picks up once again with 4 inches (10 cm) falling this month. South Lake Tahoe Weather in October: The fall season really picks up in October with low temperature averages dropping by nearly 10 degrees to 36°F (2°C). The high temperature average, on the other hand, falls by over 10 degrees to 56°F (14°C). The snow picks up as well with 13 inches (33 cm) falling and the precipitation average increasing to 4 inches (90 mm). In November, a deluge of snow comes to South Lake Tahoe with the average snow sky rocketing to 50 inches (127 cm). Likewise, temperatures drop even further to 28°F (-2°C) for the average low temperature and 44°F (7°C) for the average high temperature. December sees even more snow with 61 inches (155 cm) expected. The average high temperature continues to decrease to 38°F (3°C) while the average low temperature sinks to a frigid 24°F (-5°C). There’s absolutely no denying the fact that South Lake Tahoe is a gorgeous vacation destination no matter what time of the year it is. The only thing that you need to decide on is what in particular you are keenest on experiencing. 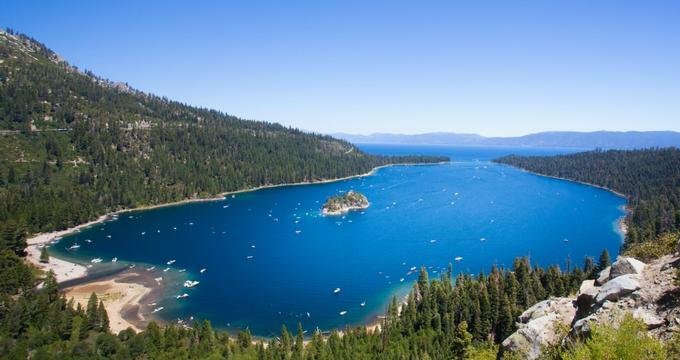 Arguably the busiest season at South Lake Tahoe, the summer months of June to August is the best time to visit to see all of the area attractions. 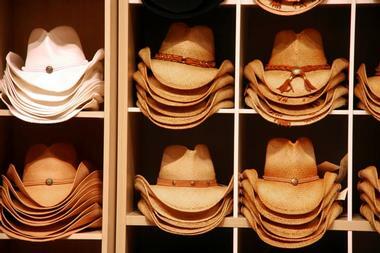 Summer visitors can also look forward to the Fourth of July celebrations in the area, which are exceptionally enjoyable. To see the best of the autumn foliage, it’s ideal to visit in October up until mid-November. Of course, skiing and snowboarding are fantastic in the winter months of November through January and can sometimes even extend until the end of May. For visitors who simply want to avoid the bulk of the tourist volume, plan your visit anytime between September and November. If you arrive by airplane, you will find car rental agencies at the Reno-Tahoe International Airport. There are nine different agencies located in the baggage claim area of the airport. You can collect your car at the Parking Structure just outside of baggage claim. There is a public bus system called RTC Ride that takes visitors from the airport to downtown Reno: the bus stop is outside of baggage claim. Some hotels provide complimentary shuttles from the airport to your hotel. There are also three paid airport shuttle companies. Taxis, limousines, and ride shares are several other options for transportation from the airport. 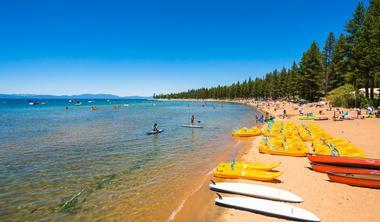 There are several ways to get around the South Lake Tahoe area. Because public transportation choices are limited and because of the size of the lake, many people choose to rent a car. 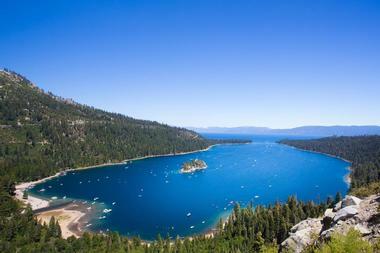 Most visitors want to explore not just the South Lake Tahoe area, but also the surrounding areas because of the spectacular scenery all around the lake. Another way is to take advantage of the free shuttles that are available between South Lake Tahoe and the ski resorts of the Heavenly Ski Resort, the Kirkwood Mountain Resort, and the Sierra-at-Tahoe. 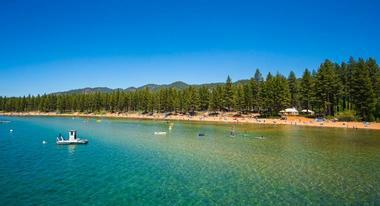 BlueGo Services and Discover Lake Tahoe are paid shuttle services. The South Lake Tahoe area offers quite a few different kinds of restaurants and cafes: there are hundreds of eateries from which to choose. There are upscale four star fine dining restaurants such as the Chart House, Cafe Fiore, Evan’s, and the Edgewood Tahoe Restaurant and all you care to eat buffets. 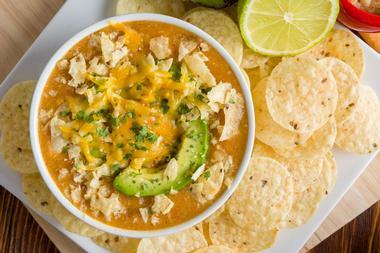 Many cafes are locally owned and serve up fresh and original dishes created by young innovative chefs. According to some people the Red Hut Cafe serves the best breakfast in South Lake Tahoe. There are also many restaurants that serve ethnic cuisine such as Chinese food at the Mandarin Garden and Thai food at Orchids. 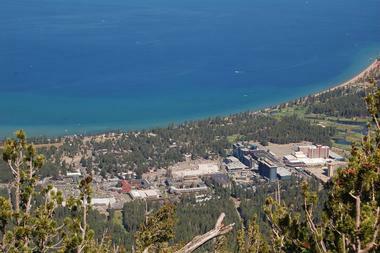 Shoppers will have fun exploring the many options in the South Lake Tahoe area. The Factory Outlet Stores at the Y sell brand name clothing and accessories at reasonable prices. There are several things to look for at the Shops at Heavenly Village: these include art works, clothing, jewelry, sporting goods, and more. There are many fine art galleries in South Lake Tahoe. One place to check out is the Marcus Ashley Fine Art Gallery: here you’ll see works represented by American and international artists including oil paintings, glass art, sculpture, and more. The Tahoe Art League Galleries and Art Around Town is another gallery to explore. South Lake Tahoe has amazing landscapes and so it is a popular place for a wedding: it offers crystal clear lake water, unforgettable sunsets, incredible mountains, and much more. 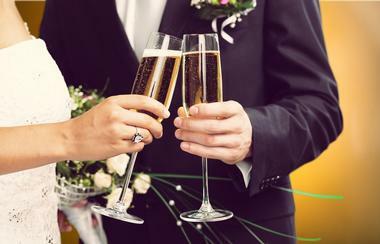 You can have your wedding on a beach with sand between your toes, or in one of the many South Lake Tahoe wedding chapels. Some of the chapels include the Chapel of the Pines which is also referred to as the “Chapel Without Walls;” and the Four Seasons Wedding Chapel Roadway Inn which offers outdoor weddings in its garden gazebo or in its lodge. Bleu Wave is a 70 foot all inclusive luxury tour boat that makes for a memorable wedding on the lake. Accommodations in South Lake Tahoe run the gamut from luxurious hotel properties to rustic cabins, bed and breakfasts, vacation rentals, campgrounds, and simple hotels. Some of the upscale properties include the Camp Richardson Resort, Inn by the Lake, Seven Seas Inn at Tahoe, Tahoe Lakeshore Lodge and Spa, Tahoe Seasons Resort, and many more. There are bed and breakfasts such as the Black Bear Inn Bed and Breakfast, the Fireside Lodge Bed and Breakfast, and the Heavenly Valley Lodge Bed and Breakfast. Casino resorts include the Broadway at Harrah’s Lake Tahoe, Harvey’s Resort and Casino, Horizon Casino Resort, Lakeside Inn and Casino, and the MontBleu Resort, Casino and Spa.